I am sorry not being able to answer to all your questions about the Swid but I am very busy at the moment. The best way to illustrate the precision, size and power of the pump is to watch the video I just made. I didn’t have time to translate my comments in English but I am sure you’ll understand. So far I am very satisfied of this appliance which is the most competitive immersion circulator of the market: EUR 449 EUR 475 incl. VAT and shipping costs. 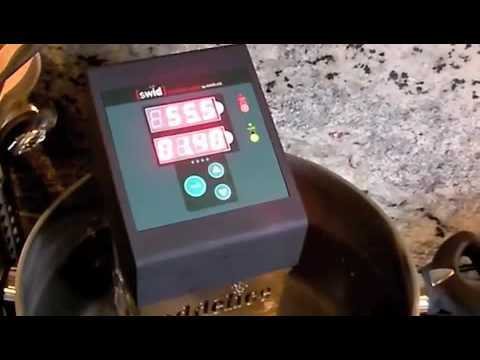 Here is a comparision table of immersion circulators dedicated to sous vide. Addélice confirmed the swid will be available this week. Thanks for the video and the picture. This imersion circulator seems to be very compact and easy to use. Did you have to tune it or is it a plug and play device? The swid is indeed very small (you can see I have put it in one of my kitchen drawer). I didn’t have to tune the swid. I just plugged it, switched it on, set the température and the timer…and here you go! It is a very easy to use machine. Jean-Francois I would like to inform you that we have begun selling an on/off type sous vide temperature controller for rice cookers and slow cookers. The units are assembled in Australia but are suitable for use around the world. The units come with a no questions asked 30 day money back guarantee. Please have a look at our web site: http://www.sousvideathome.com.au and let me know if you have any questions. Given the popularity of your blog and its up to date nature I would appreciate you mentioning this fact to the sous vide community that frequent your site. Thanks for your time. Sure, I am right now implementing your product on the supplier’s list. nice…does it come in 110 volt model?? for the u.s.?? The swid I have is a 220 V. I know Addélice works on a 110V version but have no idea when it will be launched.